I wanted to share something I worked on last month in Chengdu with Gold Thread, an awesome new video platform about Chinese food and culture. Check out their page for my story and others, including an interview with the Chinese (female!) director of the new Pixar animated short "Bao", an ode to our beloved xiaolongbao. 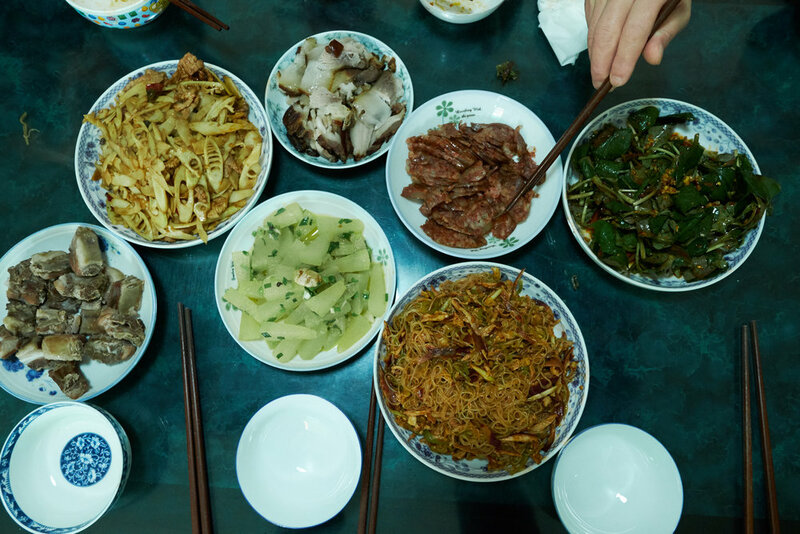 One of my earliest food memories was eating around the dining table in my grandparents kitchen in Guanghan, the small town outside of Chengdu where I was born. The dish that always stood out to me was this 'red rabbit' salad, a glistening concoction of vermicelli, leek, lightly pickled celtuce (sort of a cross between celery and lettuce), and hand-shredded cured rabbit meat. As I explain in the video, because of the warm and wet climate of Sichuan and its fertile, grassy land, there are a lot of rabbits in Sichuan, and people love eating its tasty and lean meat. If you've been to Chengdu you've probably seen the endless shops selling rabbit head and stewed rabbit meats, but 'red rabbit' 红兔 is a hyper local specialty from Guanghan that most people in Chengdu have never even heard of. 'Red rabbit' is made by hanging the meat to cure after its been rubbed in a mixture of its own blood and spices (hence the name), and then stewed in a rich and aromatic broth which gives it a deeply infused flavor and bouncy texture. You can buy them from specialty vendors (it's definitely not something you attempt at home) and they're awesome just straight steamed or in our family's preferred method of preparation, as a cold appetizer. 1. Chop the rabbit into 3 inch long chunks, shred the rabbit meat by hand, this takes patience, time and perseverance. The strips should be about half the size of your pinkie. 2. Chop celtuce into 3 inch long sticks, julienne. Sprinkle with about a tsp of salt, let it sweat for at least 15 minutes and squeeze excess water out. Should be lightly salted and crunchy. 3. Cut leek into 3 inch chunks and very thinly slice lengthwise. 4. Boil hot water and let vermicelli soak until soft but still chewy, drain. 5. Combine all the ingredients in a mixing bowl, pour dressing over and adjust to taste. You can add more chili oil, adjust Sichuan pepper depending on the freshness and potency of your variety. You want to get a very balanced spicy, savoury, acidic, sweet, and numbing taste in your mouth alongside the smokey chewiness of the rabbit, vibrant crunch of celtuce, and slipperiness of the vermicelli. The leek cuts into the strong flavors with a kick as well. Where can you get red rabbit? Only in Guanghan of course. I keep trying to smuggling it out in my suitcase, but alas, TSA always wins that battle. So you'll just have to visit and try it for yourself.